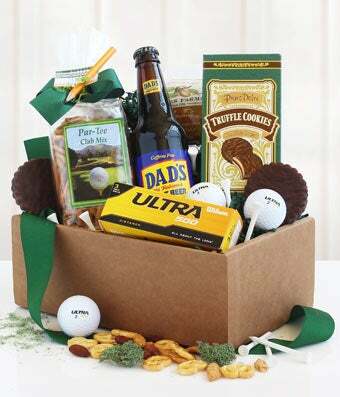 For the golf loving dad, this gift box full of snacks along with golf balls and tees will be as thoughtful as a gift as they come! Dad can enjoy some sweet and salty treats and wash it down with some root beer while he's out on the golf course doing what he loves! Sorry, there are no related products for this item. Please go back to Gift Baskets to view more products. This gift is available for delivery Tuesday - Friday. Subject to change during peak holidays. Gift delivery is available in the USA, cut-off times may vary for next day delivery when available. Cut-off time is 1PM EST but may change during the holidays.